Exotic Tigerwood flooring has become a very popular and sustainable, eco-friendly choice for new homes in the Reno/Tahoe area. This hardwood flooring option offers dramatic colors which compliment any décor, while providing excellent durability for every kind of property. Consequently, Tigerwood is always an attractive option for your next flooring project, new home build, or restoration. Exported primarily from Brazil, it can also come from Uruguay, Bolivia, and Paraguay. Tigerwood forests are quite sustainable, with the trees growing to a harvestable size in 25 to 35 years. Nor is the species anything close to endangered; harvesting is controlled to ensure that the forests are never depleted. 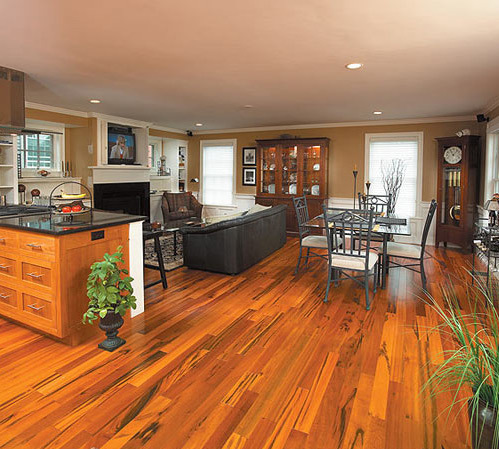 Tigerwood brings a lot of benefits to your home. The Janka hardness rating of 2160 places it well above the pack for durability; including stalwarts like Hickory and other exotics like Merbau and Jerrah. Additionally, Tigerwood is highly resistant to pests such as termites, wood beetles, and carpenter ants. That quality makes it a valuable choice for homes built near fields, wooded areas, and other wildlands. Primarily characterized by deep browns streaking across tan or orange backgrounds like the stripes of a tiger, straight grain and consistent density, there is no mistaking how Tigerwood exotic hardwood flooring earned its name. It is also known as Brazilian Koa, but don’t confuse it with Zebrawood. Being one of the harder of the Hardwoods, periodic vacuuming, sweeping, dust or damp mopping is all that’s really necessary to keep it clean. Of course, as with any hardwood flooring ~exotic or otherwise~ it’s also important to clean up spills promptly. There really isn’t much else you need to do to keep your exotic Tigerwood hardwood flooring looking great and earning you compliments. It’s probably important to note that direct sunlight can cause Tigerwood to darken over time. Some people love that effect because they feel the darker look adds warmth and beauty. Others seek to curtail it as much as possible with shades or curtains in rooms with lots of sunlight. That’s all up to you. The innate hardness of Tigerwood creates a serious challenge anyone not familiar with installing exotic hardwood flooring. Expensive, carbon-tipped saw-blades in new condition are needed just to cut or trim it properly. Anything less and you risk jagged edges, gouged splinters, wasted planks and longer installation times. None of which is good for your budget. It has been my experience that the best, most affordable way to install a gorgeous exotic hardwood floor like Tigerwood is to hire an Artisan. That way you know it will all be installed correctly and professionally, the first time. No wasted time, no wasted money. Why don’t you contact me today, so we can have a discussion on the most affordable way you can have Tigerwood exotic hardwood flooring throughout your home?